Large format poster printing can showcase your business at a trade show. You can also decorate your store with posters of your best work. We let you choose from a wide range of large sizes or pick a custom size that fits your needs. 24" x 36" is ideal for promoting big events such as concerts or for showcasing new products or services. 18" x 24" is small enough to be displayed indoors but provides ample space for colorful, visual designs. 16" x 20" is our largest size among the smallest dimensions. Ideal for displaying artwork or photographs in your store or at a gallery. Note: Custom sizes are available for customers with specific needs. What Is the Advantage of Using Photo Paper & Styrene? Our photo poster material brings out every detail in your large prints. Choose from two gloss finishes that strengthen your design’s appearance. Semigloss material brightens every kind of hue. Perfect for large posters that balance large images with text. High gloss finish works best on large posters of high-end photographs and art. Colors come out extra vibrant and strengthen the detail of the printed work. How Can I Design an Effective Poster? Stick to one point. You need to capture and sustain a customer’s attention. Avoid cluttering the design with too many elements. Stick to a central image or graphic. Don't forget branding elements like your logo, and only include the necessary information. Go the distance. Keep in mind that the poster will first be viewed from afar. Study how the colors appear from a distance and check if the combination makes a bad impression. Cut down on shades and use complementary hues to keep things easy on the eyes. Distinguish your brand with the scale and detail of large format poster printing. Upload a ready file or use our templates to get you started. You can have 1 or up to 50 large posters ordered and ready after 1 business day. Be sure to add a free proof so you can check the file before printing. Is there a minimum order for large format posters? No, you can order just 1 large format poster or have up to 50 delivered to your doorstep. How long do I have to wait for my large format posters? You can choose a preferred printing time on our online calculator, which can be as fast as 1 business day. The printing time refers to the number of days it takes to produce all the posters. To find out when your large format posters will arrive at your indicated address, input your ZIP code after selecting “Estimate Shipping Cost and Delivery Date” on our online calculator. What is your most durable material available? The 20 mil. styrene material is a durable, waterproof plastic that lasts for some time outdoors. It is recommended for displaying large format posters in an outdoor setting. 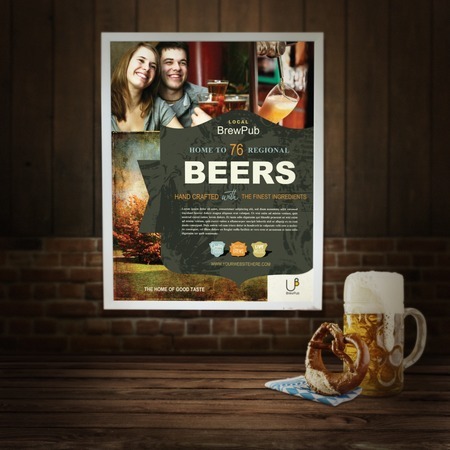 At UPrinting, you can do custom poster printing. From the home page, simply click the tab for Go to Large Format Products. We offer custom sizes for..